Hi, my name is Manny. I am a 9-year-old boy with Spastic Quadriplegic Cerebral Palsy, a Severe Intellectual Disability and Epilepsy. I need lots of help every day to do the things I need and love. I love is Thomas the Tank Engine and I like to watch him on my tuna (my word for TV and iPad). I enjoy cruising around in my wheelchair! I love swimming and anything to do with water and I give the best hugs in the world! Manny was born at 41.5 weeks and was a very big boy at 9-pound 14oz. Once Manny hit 4 months we noticed his eyes were turning inwards and after some investigation we found that he had Strabismus (crossed eyes). Manny underwent a surgery at 12 months to cut the muscles in both eyes, which has corrected them. One eye still does turn a little, but mostly when he is tired. He is under ongoing care with an Ophthalmologist to this date and into the future. At that stage we were informed that there was nothing abnormal with Manny's development, he was just behind because of his eye problems and he would catch up once that was corrected. However, a couple of months on we were still unhappy and concerned, so we requested for a referral for the Mater Children's developmental paediatrician. They had confirmed our suspicions but were not sure exactly what was going on. Just before Manny's 2nd birthday, after countless tests and doctors, we were given a diagnosis of Spastic Diplegia Cerebral Palsy and a Severe Global Developmental Delay. This enabled us to access early intervention for Manny and with a lot of speech and physiotherapy, Manny has come a long way but still has a long way to go. As Manny has aged his current diagnosis is Spastic Quadriplegic Cerebral Palsy, a Severe Intellectual Disability and Epilepsy. Manny's current mental understanding is at around an 3-year-old. He is nonverbal although says a few words and sounds that are not completely in context. He is completely incontinent. He cannot chew or feed himself, so food has to be pureed and he also has a nutrient enriched milk to boost his vitamin and mineral intake. 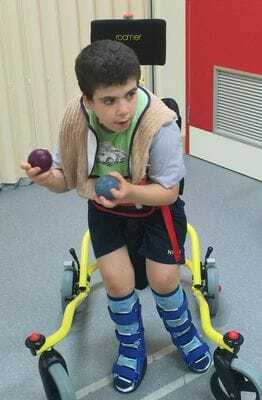 He cannot walk unaided and relies on a wheelchair to get around. Manny now also has a hoist to transfer him from and to equipment or place to place, this has helped his family members from lifting him as he is too heavy to carry now. Manny has been seeing an orthopaedic surgeon and has had several rounds of Botox which has helped with the tone in his legs. In February 2014, Manny had major surgery having both femurs broken and realigned into his hips, abductor tendons were lengthened from his groin and calf muscles were cut. He was in a maple leaf brace and plaster for 8 weeks and had recovered well. Manny went on to have the bolts taken out in November of 2014. Then 3 months post-surgery Manny broke his femur, which had set him back with more rehabilitation time, although he is on the mend and has had metal work put into place to assist with the healing time and early in 2016 the metal work was taken out. Manny is also under the care of a spinal team as he has scoliosis, they are keeping an eye on his curve in this spine. These specialists have decided to keep an eye on Manny's scoliosis until a surgery is needed. Manny has had problems with his teeth his whole life. He has had 4 surgeries on his teeth; the 1st surgery was to put in 8 crowns on the top and bottom molars and to pull a few out. Manny then ground the crowns down bad enough to then go on the have another set put on. Manny is now on his 5th set of crowns. For future medical plans, Manny currently has a spinal care team keeping an eye on the curve in his spine, he has his orthopaedic team moving towards a surgery to realign his feet and another dental surgery for upkeep. With all this going on Manny is the happiest little man we know he has brought so much joy, love and has taught our family so much about patience tolerance and to support each other no matter what. With your help, we can achieve these goals and ultimately help Manny in the long run. When you donate, you will receive a tax-deductible receipt. Please share Manny's story! Thank you all for your on-going support and thank you for reading my story! You've grown so much Manny & come so far little buddy. Wishing you & the family all the best. A donation made for Allan Groat's Christmas present.